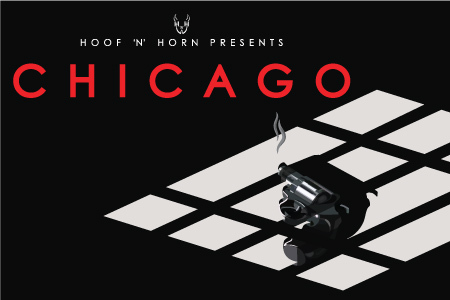 Hoof 'n' Horn's 81st season comes to a close with Chicago, the longest running American musical in broadway history. From the creative minds of Broadway legends John Kander, Fred Ebb and Bob Fosse, Chicago paints the glamour and depravity of the roaring 20's like no other. This show will draw you into the world of bootleggers, showgirls, adulterers, and all that jazz. Chicago tells the story of Roxie Hart and Velma Kelly, two experienced showgirls turned murderers, as they navigate the complex world of fame and criminality. Behind the bars of The Cook County jail, Roxie and Velma vie for their moment in the spotlight, pulling their lawyer, warden, and the press along with them. Set to a sensational and snazzy score, the 6-time Tony Award® winning production has dazzled audiences since 1975. Come experience the thrill of Chicago in Duke's newest gem on campus. Tickets can be bought at bit.ly/HnHChicago or at the Box Office in the BC.